It’s an odd feeling coming back to a hotel that was once something quite different to what it is now. Such is the case with St. James’ Court London Taj, a huge Victorian property that was formerly a pretty dodgy Crowne Plaza. Taj is a globally respected luxury brand of course, and needless to say, things these days are mightily different. And rightly so, after all an SW1 postcode and the words, Buckingham Gate in your address is not to be sniffed at, particularly when you have Buckingham Palace just a 5-minute walk away. Taj, with its Indian heritage, is all about service and style and thankfully, with a £multi-million renovation almost completed, this magnificent period building has a smile on her face once again. 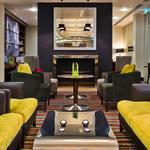 The lobby has that wow factor; an inlaid marble floor with dark wood pillars and panels and plenty of art amongst the all the cushions. The Court in question lies discreetly behind the main mansion and has its own piece of history as the home to the Lords, Ladies and Gentlemen of the Royal Court some 400 years ago. I can’t help thinking that perhaps the Bard himself once trod these very cobblestones. So a rich history here for sure, but there is more to tell. 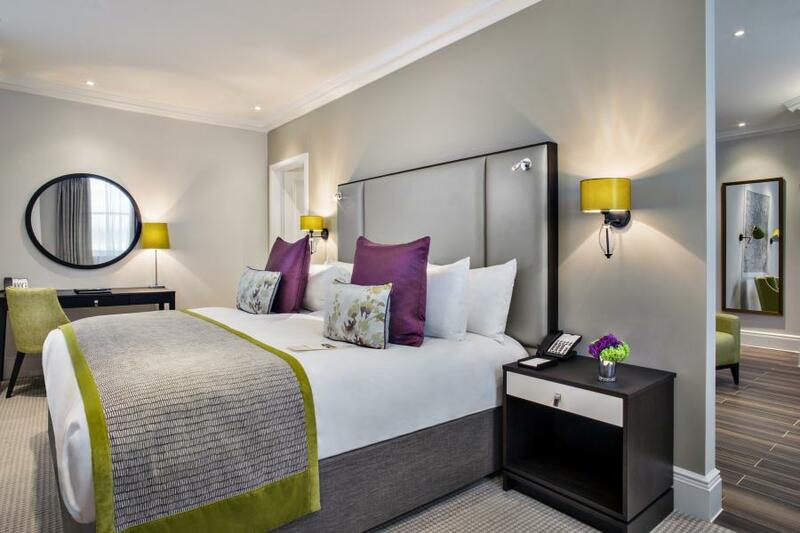 This mighty refurbishment has made-over the 330 guestrooms into individual havens, transporting you from English country classic with autumnal browns and golds, on one hand, to brand new premium chic with greys, greens and purples on the other without missing a beat. 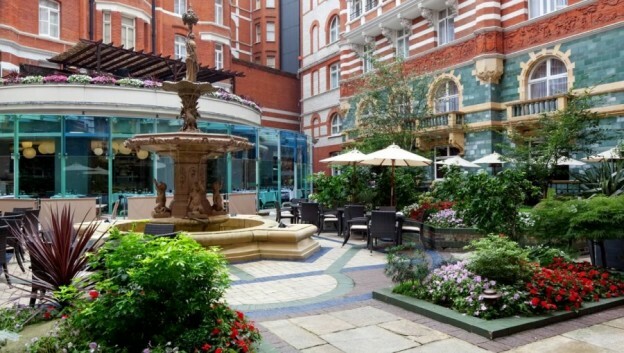 The beds are dressed in glorious high thread linens, the bathrooms large and airy with luxury toiletries and best of all for me, I overlooked that lovely famous courtyard. 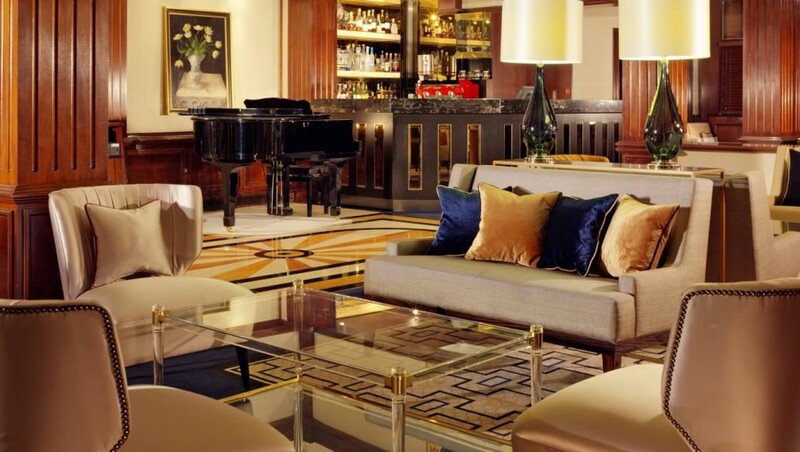 As evening draws in a pianist tinkles his grand piano ivories as lobby guests enjoy a drink or two; the sound of clinking glasses and ice cubes transforming the lobby into a discreet pre-theatre club perhaps. I enjoy a very civilized red with a few nuts before dropping into the Bistro for dinner. The Bistro offers an eclectic mix of modern European dishes but adding the Taj touch of Indian cuisine too. Where else would you find a generous starter of deliciously authentic samosa chaats with coriander and tamarind (£9) followed by a rosemary and garlic-rubbed Angus filet with mash and root vegetables (£20). 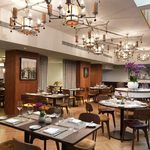 Having said that, Taj also owns Bank restaurant and the Michelin starred Quilon both next door and the Bombay Brasserie just a minute away, the food options are plentiful. I wander back up to my room passing by the courtyard fountain on my way. It really is a lovely space to enjoy some peace away from the bustling traffic of Buckingham Gate. The next morning I’m back in Bistro for breakfast. “How was the samosa chaat last night” I’m asked at the door as I give my room number. Impressed and taken aback I reply with a very lame “a real taste of authentic India.” Not my best come back, but I get a big smile just the same. Perhaps just as big a smile as this old period building following her facelift. Let’s face it; she has waited a very long time for it. 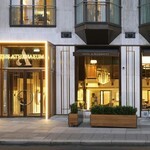 Rooms from £260 per night. 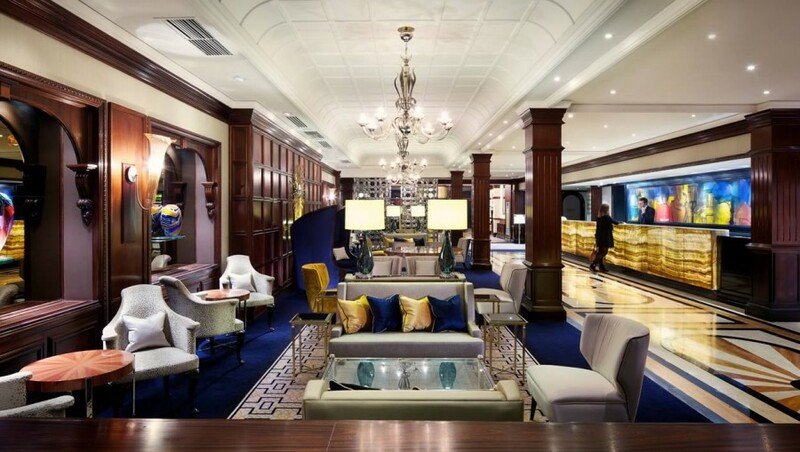 I stayed in St. James Court – Taj Hotel for 4 nights (sept 6thru Sept 9). I was told during check-in, that these 4 nights will be credited towards Inner Circle points. I have not been yet been credited after 4 months. My 3 e-mails to them did not get any response. It is a shame that the management is using Tata name and not abiding by Tata values. I am just disappointed. Points aside, did you enjoy your stay?